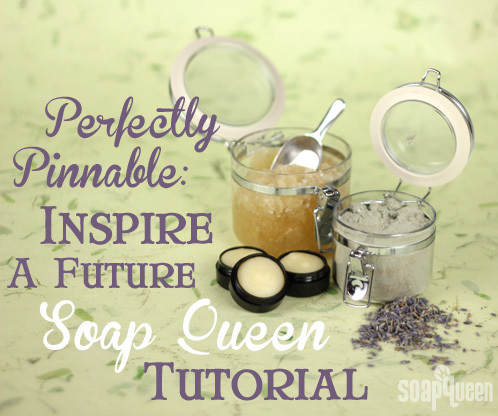 Perfectly Pinnable: Inspire a Soap Queen Tutorial! We’re looking for some awesome soap’siration for a future tutorial – and we need your help! Have you ever thought “I wonder how that’s made?” or even, “I wonder if that would work!”? Let us take on the testing and development of a recipe you inspire. Or, let us experiment with a color palette that you’ve been tossing around in your head but haven’t gotten around to using. Bonus: we want to see your inspiration in the form of a Pinterest board (because, who doesn’t love Pinterest?!). So here’s the deal. Create a new Pinterest board with a title that includes “Soap Queen” + the name of your tutorial. For example, “Soap Queen Cold Process Salt Bars” is the title of a mock board we created as an example of what an inspirational board might look like for our Pretty in Pink Cold Process Salt Bars. On your board, pin concept, color palette/inspiration, and don’t forget to include ingredients, tools, and/or packaging (if necessary) for your project! Any type of bath and body product or home craft will be considered. That includes melt and pour or cold process soap, lotion, scrubs, Fizzies,candles, etc. Once your board is completed, link it here in the comments. You have until August 5th to create your inspirational Pinterest board, so get to pinning! Soon after, we’ll choose our favorite board (or two…or three) and that inspired tutorial will be featured right here on the Soap Queen blog. Create a new Pinterest board with “Soap Queen” + the name if your tutorial as the title. Pin images that inspire and evoke the feeling of your tutorial, as well as any necessary ingredients, tools, and/or packaging. We are looking for fully-developed concepts, so the more complete your board, the better. Any bath or body product works, so that includes melt and pour or cold process soap, lotion, scrubs or candles. Link to your completed board in the comments below. You have until August 5th to link to your board. For an example board based on our Pretty in Pink Cold Process Salt Bar, click here. Your inspired tutorial could be featured on the Soap Queen blog! I was *just* thinking how much I’d love to do these melt and pour gem soaps if I could ever figure them out! I am loving anything vintage at the moment so here is my board link and inspiration. Hi! I’ve been trying to come up with a nice milk bath to round out my products and this was a really fun exercise that got me thinking! It would be so awesome to get your ideas on this and possibly see a tutorial on the blog. Thanks for sharing your very inspiring Pinterest board! I love the the mix of gorgeous photos and ingredients. It’s exactly what we were hoping to see. I’m glad our instructions made sense and resulted in such a beautiful board. I’ve been thinking about this idea for a long time so this was the perfect opportunity to really get my creative juices flowing! Here’s my inspiration board. I’m working on this idea this week so I’m curious if you end up choosing it if they will be similar outcomes! here’s the link for the board I created for a soap I’ve been tossing around in my head for a couple of weeks, but haven’t yet struck upon the design I want to do with it nor cemented the FO down firmly. I’d also considered your Beach Breezes for obvious reasons in stead of Ocean Rain. Just haven’t been able to pin it all down yet – sorry about the awful pun. I’ve seen tutorials for CP shampoo bars but really haven’t come across anything for solid conditioners. And with companies like LUSH that charge a pretty penny for theirs I’d love to see something that we can do ourselves. I’ve experimented with hair lotions and balms but nothing specifically for conditioning. Oh my goodness please I hope someone does eyeliner!!! It is so expensive and hard to get that one with the perfect consistency.